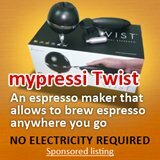 This is about a capresso drip coffee maker which I am sure would be missed by some coffee lovers, the consolation is of course there are great capresso coffee machines around! 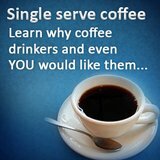 Coffee drinking is getting more and more popular. 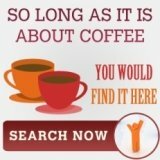 Home coffee makers, coffee grinders, grind and brew coffee makers are getting more and more advanced as the years go by. 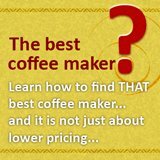 Yet, despite all these advancements, there is still a need for small, simple, and inexpensive coffee makers that make great coffee. For instance, the Capresso 402.01 coffee maker is a small and inexpensive 4 cup coffee maker that performs quite well. This Capresso drip coffee maker is very well designed, very easy to use, and makes great coffee. The Capresso 402.01 is perfect for those who do not have a lot of counter space. It measures a mere 10 by 6 ½ by 11 inches. This Capresso drip coffee maker is perfect for small households that need a coffee maker that brews less than 10 cups of coffee. Second, it’s very easy to use. The filter basket is easily removable, making the insertion and removal of paper filters and coffee grounds very straightforward and effortless. The water reservoir has an easy to read water level indicator, which makes it easy for its users to see if it has enough water to brew 4 cups of coffee. Furthermore, it has a pause-and-serve feature, allowing its users to pour a cup during the middle of the brewing cycle. When the glass carafe is removed, the drip action ceases until the carafe is returned. Best of all, this Capresso drip coffee maker is inexpensive. The only drawback to the Capresso 402.01 is that it’s hard to find in local or online stores, which is quite disappointing since this coffee maker, despite being very simple, is very well designed, makes great coffee, and is one of the best 4 cup coffee makes ever designed. 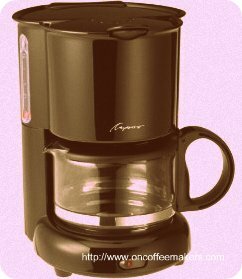 However, since this Capresso drip coffee maker is very hard to find these days, there is another coffee maker from Capresso that seems to garner a lot of praise as well that would make it a very suitable alternative, albeit more expensive, to the Capresso 402.01, the Capresso MT500 Plus. The Capresso MT500 Plus brews up to 10 cups of coffee. If you’re tired of using plastic coffee makers, you’ll be pleased to find out that this coffee maker will match with your other metallic kitchen appliances, since it has a metallic alloy body and a stainless steel thermal carafe. This coffee maker starts out where the Capresso 402.01 left off, and has drastic improvements that make it more reliable, convenient, and efficient. For one, the MT500 Plus is programmable and has a 24 hour timer, allowing you to set the time you wish for it to brew. Therefore, if you want to wake up to a freshly brewed pot of coffee, just prep the coffee maker to brew a few minutes before the alarm in your bedroom goes off. It conveniently comes with its own permanent gold tone filter. So, you don’t have to stock up on paper filters anymore. It also has the pause-and-serve feature that the Capresso 402.01 has. Most importantly, the MT500 Plus has a stainless steel thermal carafe. With a stainless steel thermal carafe, you don’t need to worry about your coffee getting burned. since a thermal carafe does not need to use a warming plate to keep the coffee hot. You can be sure that the last cup of coffee is as hot and as fresh as the first one, even hours after the coffee has been brewed.